An exhibition of new paintings by Samantha Hobson. Samantha Hobson began painting with the Lockhart River Art Gang, a group of young Indigenous artists from the remote Lockhart River community on the east coast of far north Queensland. Hobson is one of the original group now forging successful solo careers. Her work is inspired by the beauty of the Eastern Cape and by the fast disappearing traditional beliefs, with darker references to the harsh social conditions experienced by many Aboriginal peoples in isolated communities. 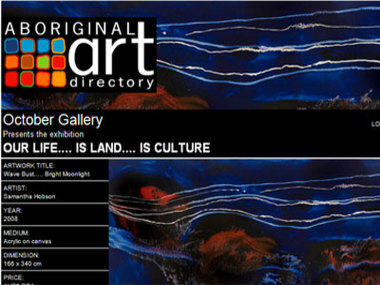 View October Gallery presents Our Life.... is Land.... is Culture, London UK eBlast.